Set sail on a voyage of a lifetime from Fremantle. Visit iconic Rottnest Island and be amazed by the breath-taking scenery and attractions. Uncover some of Australia’s most remote and sought-after regions as you marvel at the pristine natural beauty during an overnight stay in Broome. Discover an untouched island paradise on Komodo and vibrant, historic wonderlands in Bali and Semarang. Experience Singapore, an ever-evolving melting-pot of culture and heritage. One way economy flight SYD/MEL/BNE/ADL to Perth. Full day Rottnest Island Grand Island tour including lunch. 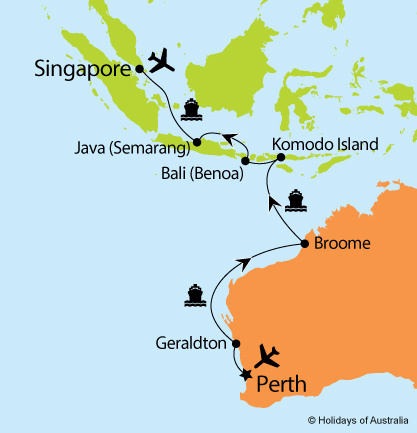 12 nights aboard Vasco da Gama cruising from Fremantle to Singapore with port calls in Geraldton, Broome, Komodo Island, Bali (Benoa) & Semarang. Your cruise includes on board meals & entertainment. 3 night stay in Singapore at the Peninsula Excelsior Hotel including breakfast. 48 hour Hop-on Hop-off Big Bus pass including entrance to the Twin Conservatories in Gardens by the Bay. Morning at the Zoo tour including breakfast. One way economy flight from Singapore to SYD/MEL/BNE/ADL.